Is everyone ready for Christmas? I was panicking a bit at the beginning of the week but I think I have a handle on things now. Most of my shopping happened online and I have just one or two things I need to run out and get. This girl doesn’t have much time for going shopping these days. 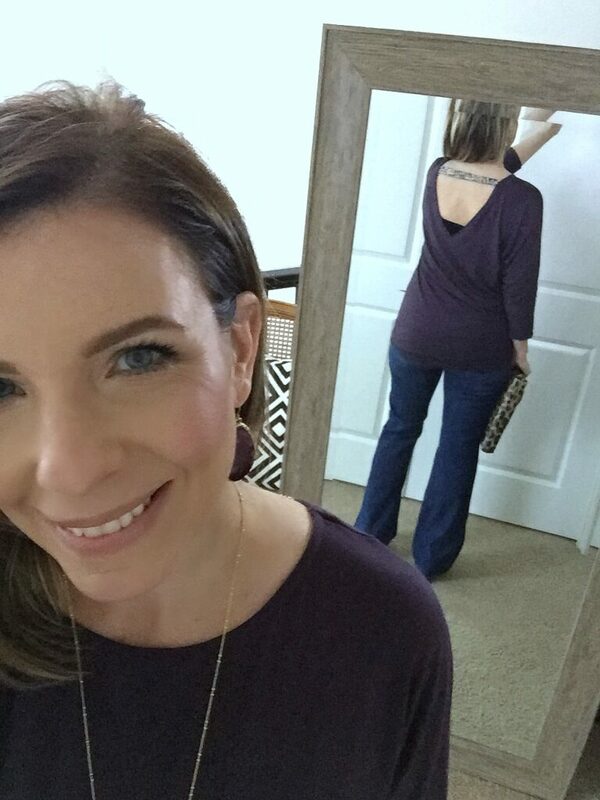 Which brings me to my December Stitch Fix Review. 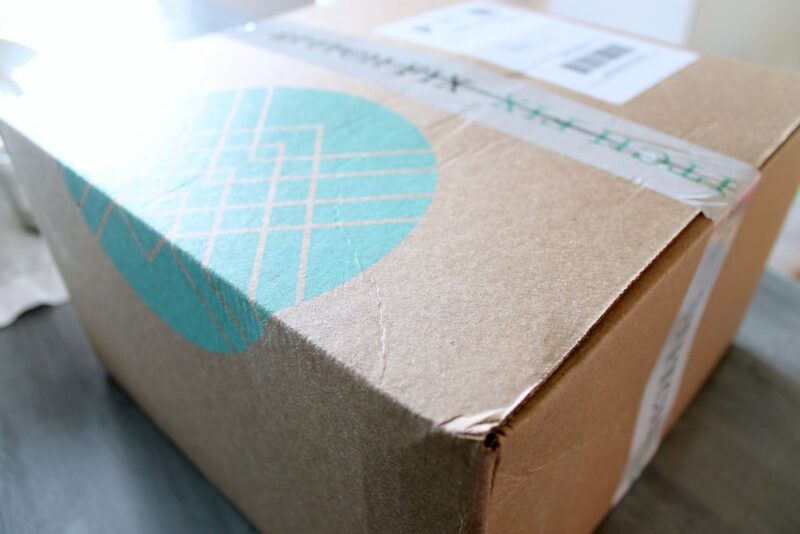 Do you know about Stitch Fix yet? Let me tell you a little about it. 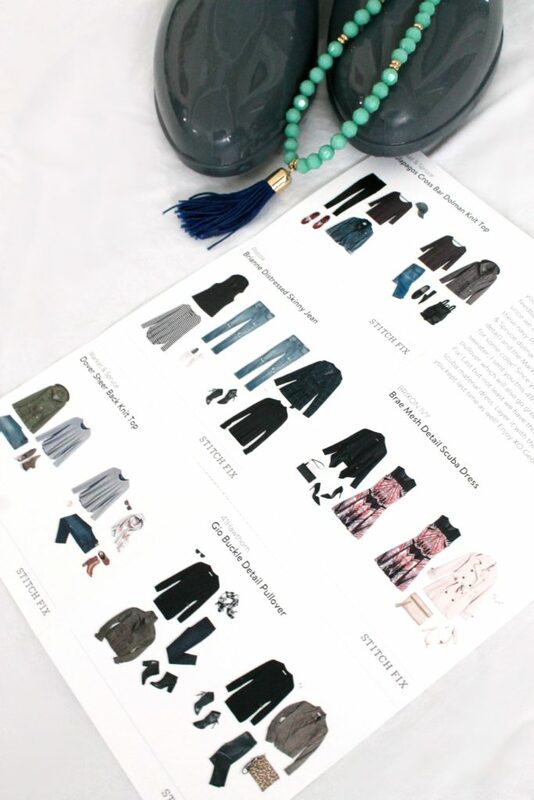 Stitch Fix is a monthly (or more often or less often) clothing subscription service that I started subscribing to last year. If you are someone who hates to shop or just doesn’t have the time then this service is perfect for you. 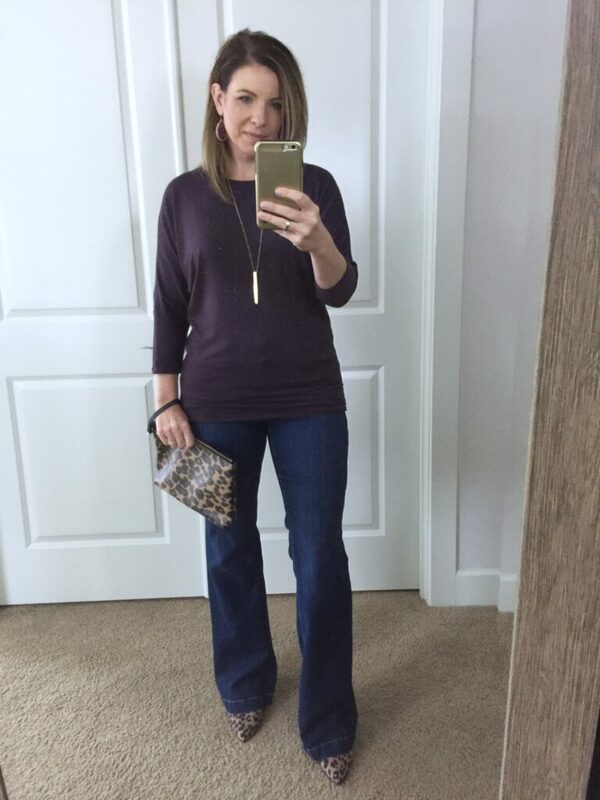 When you sign up with Stitch Fix you will fill out a questionnaire about your personal style. Your stylist will then send you 5 pieces of clothing for you to try on at home-no leaving the house! The fee is $20 per fix however when you make a purchase that styling fee is deducted from your total. If you have a perfect fix and you keep all five items you get a 25% discount on your total order. You can also set the price points of your fix. I have my prices set to the lowest setting. Once you try on your items and decide what stays and what goes, you just toss the unwanted items back in the pre-paid return envelope they send with every fix. It really doesn’t get much easier than this. And their customer service is the best. Once I accidentally returned a red oven mitt with my returned items. They emailed me to let me know and sent it back. I had been looking for that red oven mitt everywhere! This is my 9th fix but obviously my first review here. 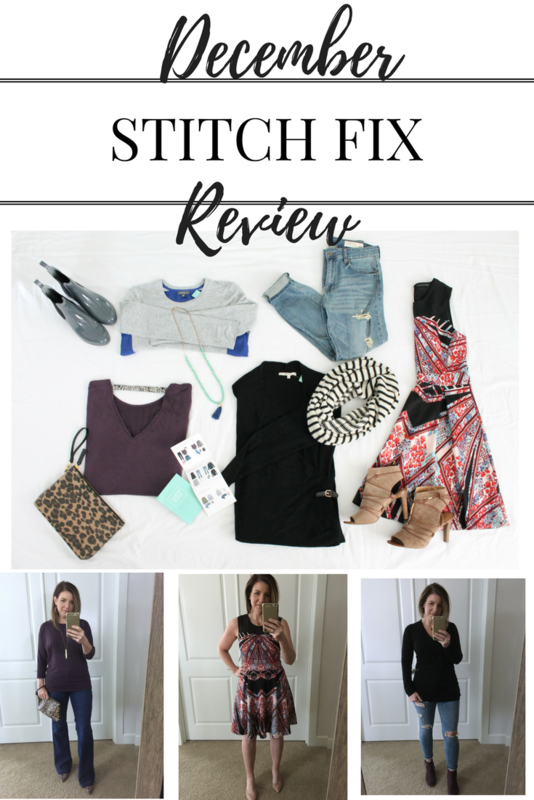 I have quite a few Stitch fix pieces in my wardrobe that I go to over and over. 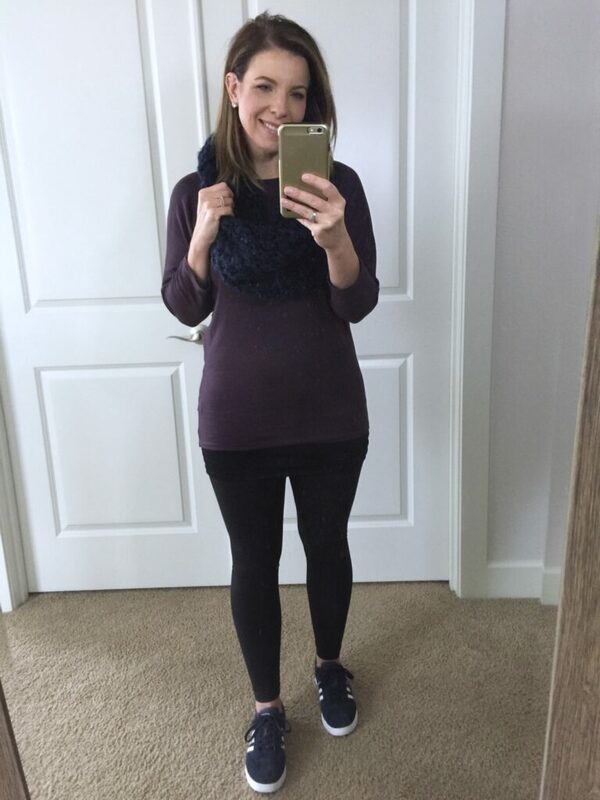 I originally started post-prego because I had nothing to wear, nothing that fit and a baby that limited my ability to shop for longer than an hour at any given time. I was doubtful at first. Until I got my first fix. Inside were two pairs of jeans and both jeans fit perfectly. Now normally when I jean shop, I set aside a full day to try on only jeans. I usually trudge from store to store to find 1 pair of jeans that fit just ok. And here I was, at home, with only 2 pairs of jeans to try, and both fit amazingly. I was hooked!!!!! I have to admit when I pulled this top out of the box I had my doubts. I can honestly say I don’t own anything in a plum color. I really thought it wasn’t a good color for me. Turns out I was wrong. This top turned out to be so cute! And versatile too. I can wear it dressed down with athlesiure (which is pretty much my daily uniform). I did add a long tank top for a little extra coverage over my leggings. Or I can dress it up for date night. The cutout in the back is super cute and I kind of have a thing for outfits with this cutout trend. This one is a keeper. This was a tough one. I think I tried this top on about 5 times trying to decide keep or return. I actually really liked it and I could use some color in my wardrobe. But I ultimately decided to return it because I have a ton of gray in my wardrobe. And the back was pretty sheer. It would need to be layered with a tank to be comfortable and not freeze this winter. I requested a casual dress this month just because I’ve never received a dress in any of my fixes. 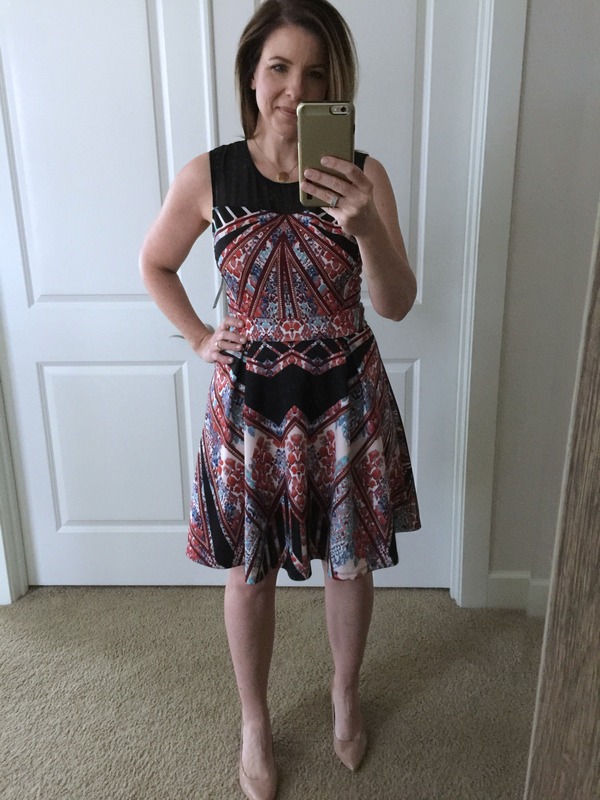 I would say this one was a bit more dressy than I was looking for. And honestly, when I took this one out of the box I thought, there’s no way. The colors are all wrong! However, it fit like a glove. I actually really liked the style of the dress and this is certainly not something I would have picked myself. One thing though. And once you see it you won’t be able to unsee it. There appears to be an evil jack o’ lantern face jumping out of my lower mid section. See it? You’re welcome. Once I saw it, I couldn’t unseen it either and so back it goes. 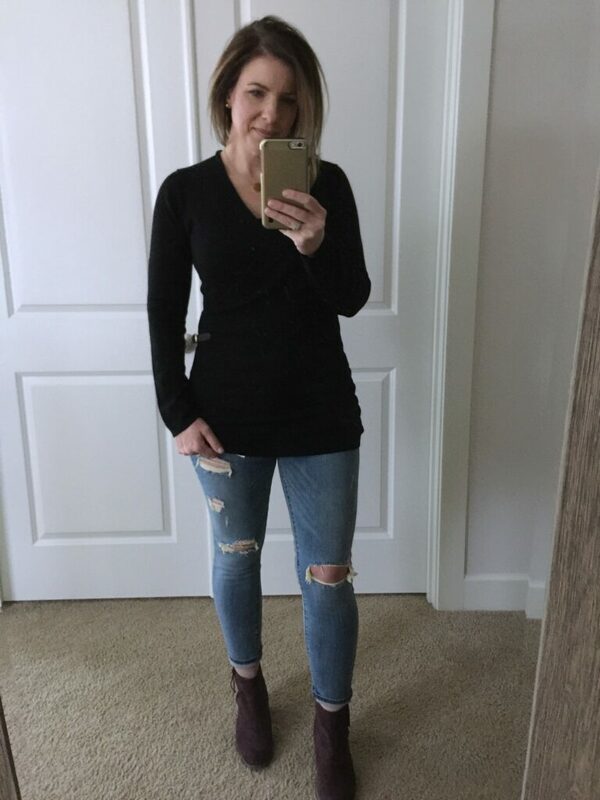 My stylist sent this to me because it is a longer sweater and last month I kept the longer tunic length pieces she sent. This sweater was also really flattering. The v neck is great and it has a cute buckle detail on the side. However, I decided to return it because it’s black and I have a ton of black in my wardrobe already. It’s pretty easy for me to find black tops on my own. And I actually don’t wear much black as I find it a bit harsh on me. I’m more likely to wear navy blue. This one went back too. 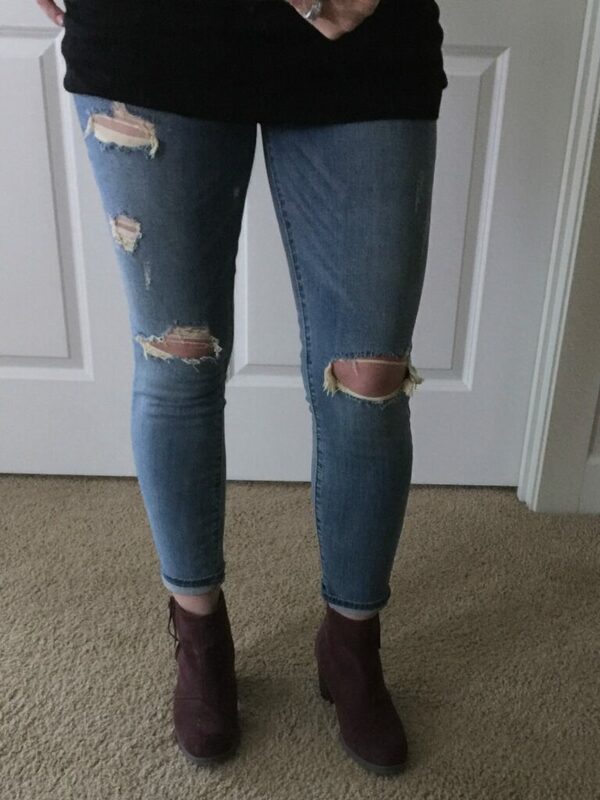 I requested distressed jeans and received these skinnies. Despite my past successes with jeans, these were just meh. They were too long in the rise and not as comfortable as the jeans I have received in the past. Also, the distressed areas had a yellow tone to them from the denim’s wash. Yellow tones, not cool. These went back in the bag to Stitch Fix. This Fix was only a 1 out of 5. But I really wasn’t disappointed. I did request some different items to try and they just didn’t work out this time. I was also trying to save a bit of money seeing that Christmas gift shopping can be a budget buster. 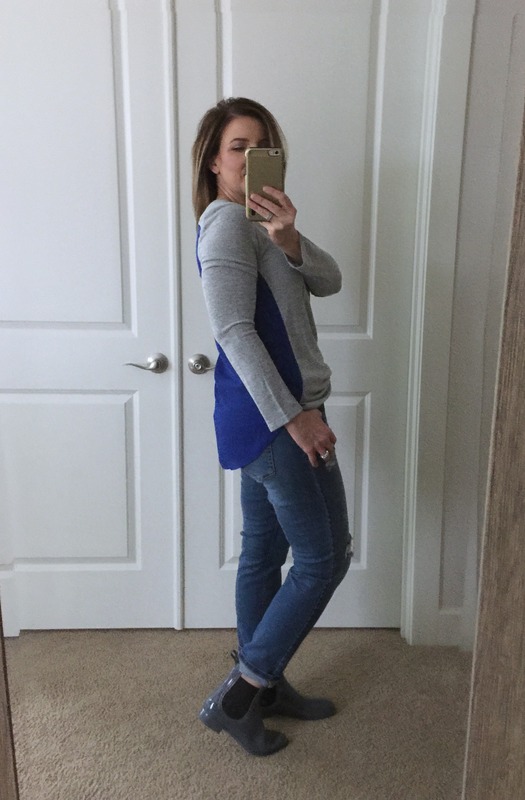 I’m really happy with the Dolman top that I kept so I would actually call this fix a win. Don’t forget you can get your own fix by clicking HERE. It also makes a great Christmas gift! 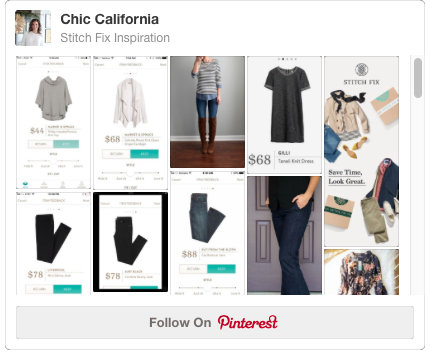 And you can see the lastest styles I’m pinning by following my Stitch Fix Inspiration Board.